Last week at lab meeting, I found myself having the absurd discussion of how to best train a mouse to lick a water spout. Mice don't have many ways to talk to us dumb humans, and head-fixed mice have even less. The best way we have is licking. After lab meeting, I did some Google Scholaring, and found a great little article that quantified mouse lick rates. In two mouse strains! Comparative mouse licking ethology! It doesn't merit a full blog post, but I wanted to highlight the main findings for all you other mouse lickers out there. They used a lickometer (pardon the technical jargon) to measure how often C57 and DBA/2J mice licked. They found mice licked in bouts of 1-20s, about once a minute. Mouse licking. A. Mice lick in bursts. B. Individual bursts have regular licking. C. Inter-lick-interval during bursts. From Boughter et al 2010. 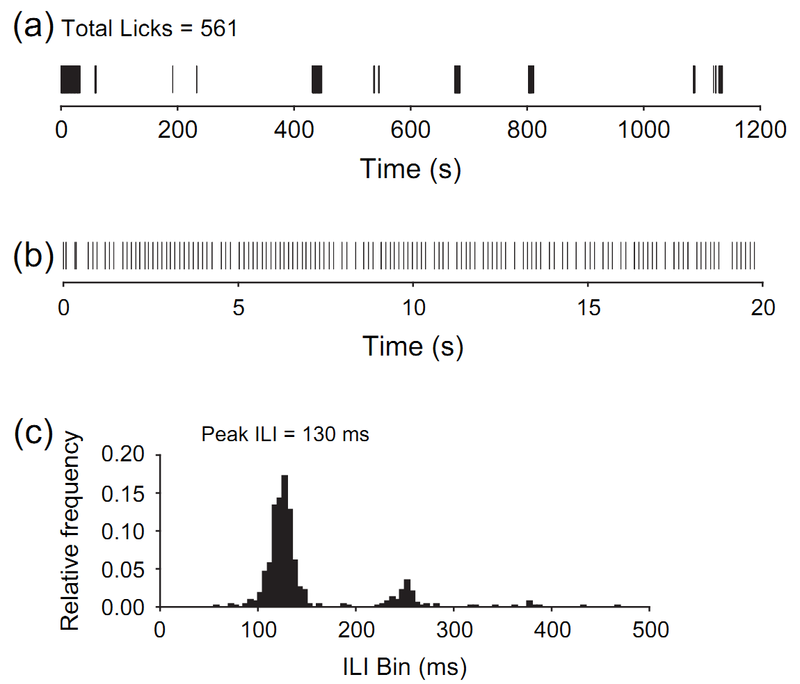 As you can see in the inter-lick interval (ILI) histogram above (panel c), licking is highly regular, but mice occasionally miss a lick, either due to lickometer error, or actual pauses in licking. There is a much smaller third harmonic. During the bouts, C57 mice lick at 8Hz, while DBA mice lick at 10Hz. C57/B6 mice have more licking bouts than DBA/2J mice, but lick more slowly during them. From Boughter et. al. 2010. Since C57 mice lick at a slower rate than DBA mice, they compensate by having more licking bursts (compare black and white bars). The average lick volume for both strains was 1.2uL. I love that papers like this exist, because their kinda handy, and kinda absurd. Another paper along these lines is, "Distribution of serotonin immunoreactivity int he main olfactory bulb of the Mongolian gerbil." Just don't tell Sarah Palin. Boughter Jr, J., Baird, J. P., Bryant, J., St John, S., and Heck, D. (2007). C57BL/6J and DBA/2J mice vary in lick rate and ingestive microstructure. Genes, Brain and Behavior 6, 619–627.